I haven't been to nearly enough barbecues this year - though I've been treated to some nice ones, and let's not forget Texas! If we factor in the extraordinarily mild summer we've had, though, I'd say everyone in my region should be eating outdoors more often. For the first time in ages, I don't want this season to end! I was thinking about a particular barbecue a few years ago when it was probably more oppressively warm. My sister and I were probably reminiscing about the wonders of autumn, and all the indoor times we could enjoy. We humans are never satisfied with what we presently have - and that goes double for New Yorkers! I tend to mention during such conversations that I almost never bake between June and September, or even cook much, and though I do spend time indoors, it's not quite as cozy with the a/c blasting. Well, along these lines my sister brought up a mini ritual she shared with her husband on some evenings, which they dubbed "Tea and an English." This was comprised of cups of likely herbal tea, maybe cake, and a period film or televised drama, or perhaps a mystery program. For the most part, the evening's entertainment was of an English nature. In case you haven't gathered from previous posts, this very much reflects the evenings we'd spent as a family growing up, though now there was a name to it. Despite it being pleasantly mild, I'm still a little allergic to summer mentally. This was brought home to me during an otherwise good week in July when I ended up in the hospital after a rather violent panic attack. Though these things have a number of underlying causes, it was no coincidence that I'd had my "monthly coffee" the previous afternoon - an iced vanilla latte from Starbucks. Now I know that I must never, under any circumstances, drink a whole cup of caffeinated coffee - even decaf is a little risky to my system but if I get a true craving I might go there. I need to keep even my caffeinated tea drinking down to maybe one cup a day - which means I'll make sure it's a good one each time! And I've brought in even more herbal tea - tisane - into my life. My own "Tea and an English" usually consists of either a choice from Netflix, or the occasional broadcast TV moments. There's still a touch of loyalty to the "Masterpiece" programs on PBS, and there's nothing like watching a mystery program at the time it's airing. After Endeavour was over for the year (more cliffhangers! ), it was advertised that PBS would be airing two new Poirot stories. I hear that for some reason the two final episodes would not be aired in the US, which I don't understand, as there are the truly last ones Agatha Christie wrote. Nevertheless, it occurred to me that I hadn't watched a Poirot on my own...ever. I know it wasn't one of the favorites in my family growing up - though my other brother-in-law liked it apparently - but neither was Doctor Who, and...well. It wasn't fair to leave Poirot out, actually. After all, I played Agatha Christie - or a satirical version of her - in our 6th grade production of "Murder on the Orient Express Subway". I grew up in Queens, remember. It was the only chance I'd had to act in a school play, since most of them were Christmas productions and I've never celebrated Christmas. Anyway, it was a cute adaptation, and one written I believe when Christie was still alive - she died the year I was born. 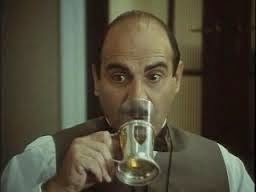 We put on the play around the same time David Suchet helped make the Belgian detective a household name again. Decades later, with the magic of streaming whole television series, I became (re)acquainted with this character. All in all, I like Hercule Poirot. He can be a little arrogant, but no more than Sherlock Holmes who I still adore, and he's a little more personable I think. He's incredible clever, fussy with his appearance - and that mustache! I don't prefer mustaches, but on Poirot it's perfect. There's a poignancy to his being a foreigner - one from a not too distant land but viewed as lacking in understanding in some quarters - that gives him a sort of relateability to anyone who's felt like an outsider. The stories themselves can be repetitive - many jewelry robberies and readings of wills, people in poor disguises...and how many times does Poirot and Hastings visit the seaside and well-appointed country homes? Yet I'm glad for watching. It's a good show to wind down with after a long day. And it coincides with my need for a relaxing beverage - the tisane. The word 'tisane' was popularized through the preference of this fictional detective. Poirot expects his tisane as a specific time each day, and it's not an easy task to make it correctly. He likes other drinks, but this one is his essential one, and there is consternation on his part if it's not accessible at any of the many hotels he stays at (where someone usually gets murdered.) And now, when my caffeine intake must be further diminished, it's nice to find a co-drinker of the herbal infusions where I can. Of course, these observations only come from one particular adaptation, and to get to know Poirot well I may have to read some of the novels they're derived from. A book lover's life is never dull! NEW DOCTOR WHO TOMORROW!!!!!!! Tea and a Gallifreyan! Yeah, maybe I'll end up watching Poirot eventually with my facorite tisane: Rooibos! !